The mammalian gut is warm, moist, and incredibly nutrient-rich–an environment that is perfect for bacterial growth. The communities of "good bacteria" in the gut, commonly referred to as the microbiome, are vital partners for the body, helping to digest fiber, extract nutrients, and prevent various diseases. We are all familiar with the immune responses and illnesses that ensue from bad, or pathogenic, bacteria entering the body–so, if the immune system evolved to repel microbes, then how do mammals maintain harmonious relationships with the beneficial bacteria in the gut? First, the researchers aimed to examine B. fragilis's symbiotic relationship with the gut by physically looking at the locations where the bacteria reside. 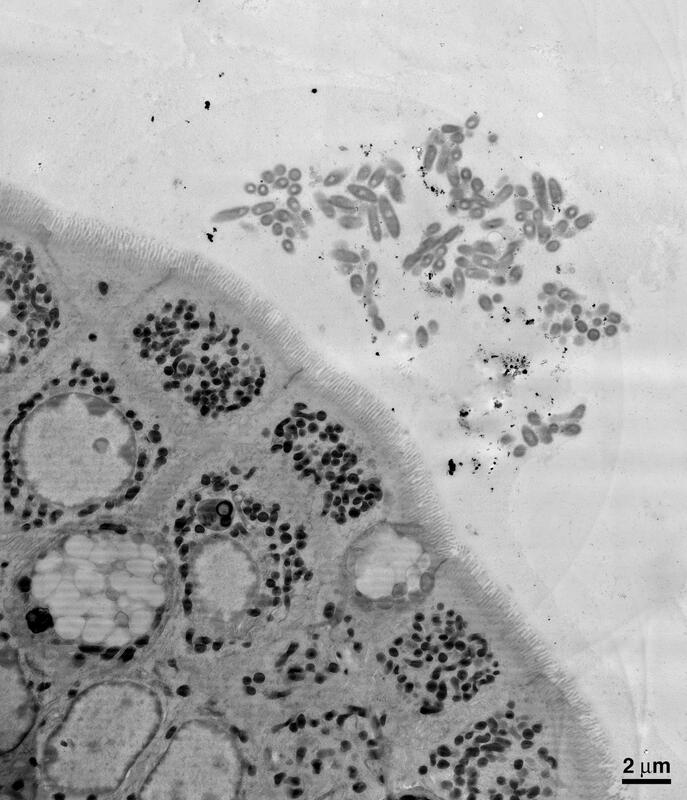 Using electron microscopy imaging on samples of mouse intestines, the team was able to see that B. fragilis clumps together in aggregates deep within the thick layer of mucus lining the gut, nestled close to the epithelial cells that line the surface of the intestine. Donaldson and his collaborators theorized that this spatial niche is necessary for a single species to settle in and establish a stable foothold. The team next aimed to determine what mechanisms allow B. fragilis to colonize such a niche within the gut. They found that each B. fragilis bacterium is encased in a thick capsule made of carbohydrates. The capsule is typically associated with pathogens (bad bacteria) attempting to cloak themselves from recognition by and attack from the body's immune system. Mutant bacteria lacking this capsule cannot aggregate and do not inhabit the mucosal layer. Thus, the researchers theorized that capsular carbohydrates are necessary for B. fragilis strains to monopolize their niche in the gut. "It is surprising to find that an immune response actually helps beneficial bacteria to thrive, which in turn helps the host thrive," says Donaldson. "The study of immunology has mainly been in the context of pathogenic bacteria. But there are trillions of bacteria in the gut, and most of the time none of them are making you sick. Our study shows that there is active immune recognition of these bacteria, but it helps rather than hinders them. This suggests that the immune system is more than just a defense system and antibodies are more than just weapons." "Over the past decade, many studies have profiled the gut microbiome in a variety of diseases, lifestyles, geographies, and following birth," says Mazmanian. "We've learned that the community composition of the microbiome correlates with particular conditions–for example, altered microbiome configurations may contribute to inflammatory bowel disease, autism, and Parkinson's disease. What has remained largely unknown is how a microbiome is established and maintained in the first place. Our study reveals a molecular mechanism by which specific beneficial bacteria actively promote long-term intestinal colonization by engaging and co-opting the immune system, rather than trying to evade it as pathogens do. This discovery may lead to new ways to correct microbiome imbalances, and perhaps to prevent and treat a variety of human disorders." The paper is titled "Gut microbiota utilize immunoglobulin A for mucosal colonization." In addition to Donaldson and Mazmanian, other Caltech co-authors include Mark Ladinsky, electron microscopy scientist; Kristie Yu (BS '17), former undergraduate student; Bryan Yoo, graduate student; and Pamela Björkman, Centennial Professor of Biology. Additional co-authors are Jon Sanders and Rob Knight of UC San Diego, Wen-Chi Chou and Ashlee Earl of the Eli & Edythe Broad Institute of MIT and Harvard, and Margaret Conner of Baylor College of Medicine. Funding was provided by the National Institutes of Health, the National Science Foundation, and the Heritage Medical Research Institute.